This article is about the railway station. For the town, see Paravur, Kollam. For famous beach, see Paravur Thekkumbhagam. Paravur railway station (Code:PVU) is a railway station in the Indian municipal town of Paravur in Kollam district, Kerala. Paravur Railway Station falls under the Thiruvananthapuram railway division of the Southern Railway Zone of Indian Railways. It is a 'NSG 5' class(formerly D-class) railway station coming under the Southern Railway Zone. The annual passenger earnings of Paravur Railway Station during 2016-2017 is Rs. 1,47,90,285 and it is third in position from Kollam district among the stations collecting more than Rs.1,00,00,000 through passenger tickets. Paravur is connected to various cities in India like Kollam, Trivandrum, Ernakulam, Calicut, Thrissur, Kannur, Bengaluru, Chennai, Mumbai, Madurai, Kanyakumari, Mangalore, Pune, Salem, Coimbatore, Trichy and Tirunelveli through Indian Railways. Proximity of Paravur railway station to the core Paravur town and Paravur Municipal Bus Stand is making it as one of the important public transport hubs in the district and the state. The Madras-Quilon line was extended to the capital of the Princely State of Travancore. Paravur Railway Station was opened on 4 January 1918 along with the inauguration of Quilon - Trivandrum Central Metre Gauge Line. During that time, Paravur was the most important railway station between Kollam and Trivandrum with maximum number of halts of trains. Important trains like Chennai Mail had halt at Paravur then. Paravur is a tourism spot with estuaries, backwaters and beaches. Estuaries in Paravur attracts a good number of people. Paravur railway station is located at Paravur town center, which gained in significance because of proximity to famous Puttingal Temple, Kollam Government Medical College in Parippally, proposed Kinfra Park in Polachira, LPG filling station in Ezhippuram(Parippally) etc. It is the only railway station in the Chathannoor constituency. People from Paravur municipal region and neighbouring Poothakkulam, Chathannoor, Chirakkara, Kappil(part of Edava Panchayath) and Parippally panchayaths are depending on this railway station. Paravur railway station is declared as the gateway station of ESIC Medical College, Parippally. During 2012-2013, Southern Railway has given halt for 3 pairs of trains at Paravur railway station. That helped to give a 40% increase in revenue of the station. Some of the major trains having halt at the station. Paravur Railway Station is an 'Adarsh Railway Station'. However, stoppage of Ernad Express, Netravati Express, Amritha Express trains have been a long-standing demand of Paravur people. Two more Kollam-Kanyakumari MEMU services and a Punalur-Kanyakumari Passenger are expected to start service soon with halts at Paravur. Wikimedia Commons has media related to Paravur railway station. ^ "Southern Railway - Annual originating passengers & earnings for the year 2016-17" (PDF). Retrieved 24 April 2018. 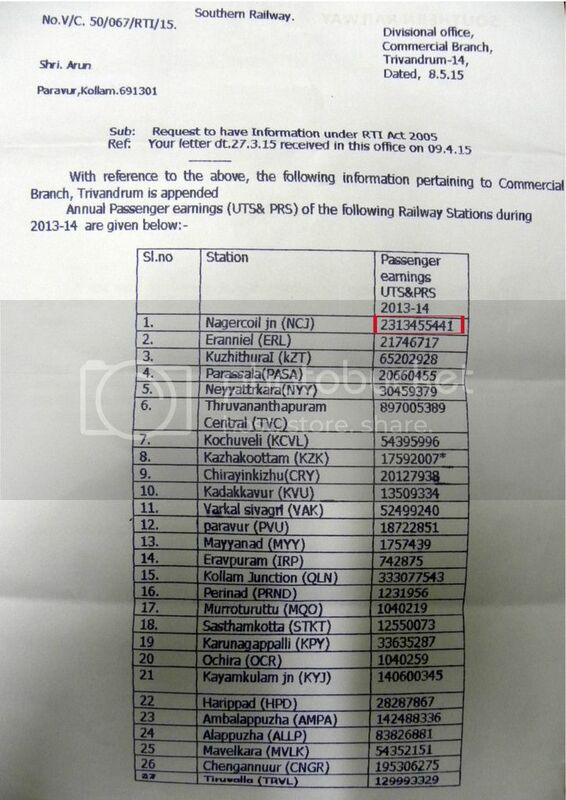 ^ "Annual Passenger Earnings details of Paravur Railway Station during 2013-2014 - RTI Response No.V/C. 50/067/RTI/15". Retrieved 8 June 2015. ^ "Quilon - Trivandrum Central Metre Gauge Line". Retrieved 15 December 2014. ^ "Stations Profile 2017" (PDF). Indian Railways. Retrieved 14 March 2018. ^ Zone-wise list of 976 stations identified for development as "Adarsh Stations"